My friend Chris Marshall from Sans Bar in Austin, Texas had a tv spot on his local news show Studio 512 last month and he was so kind to let us make a drink for him to share! We worked hard at getting this recipe just right - it’s not just a pop and pour (mixers and soda)…it’s cooked:) Meaning: you have to simmer some stuff on the stove and even do a little blending to get your base. This all sounds fine but when your city is in the middle of a water crisis (strict instructions to boil ALL water) suddenly what should be easy becomes…not so easy. Chris did a great job with the help of our team and was able to serve the host an amazing drink and even gave us a shout out on the show! 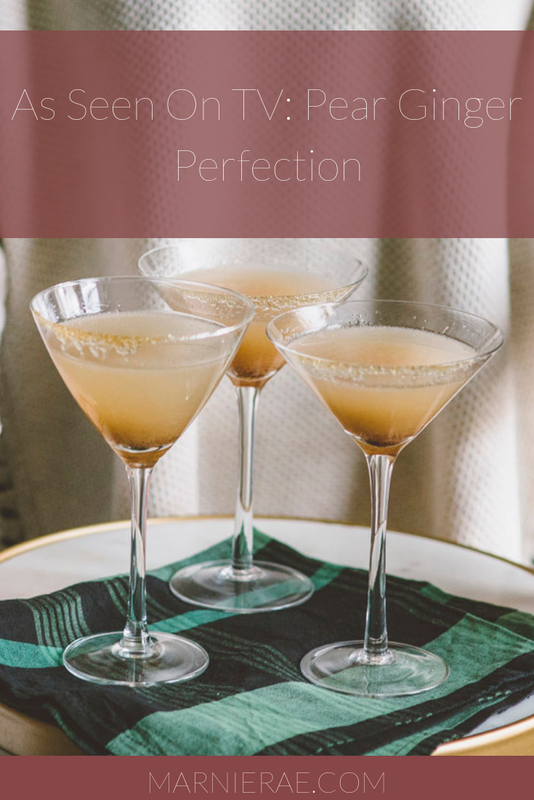 Since she’s already somewhat famous, The Pear Ginger Perfection (or PGP) seemed like the perfect drink to share with you all. So my friends, here she is. Bring to a light boil on Med heat. Turn off heat and let sit covered for 20 minutes. Combine 2 oz of base + 6 oz Vanilla Dry Soda in a shaker. Strain into martini glass, or serve over ice. This recipe makes approximately 12 servings. 7 Glasses I'm Loving From Anthropologie!